2014 is here! And what better way to celebrate than paying homage to a superstar who despite the passage of time, has managed to maintain a level f fabulosity that very few can emulate. 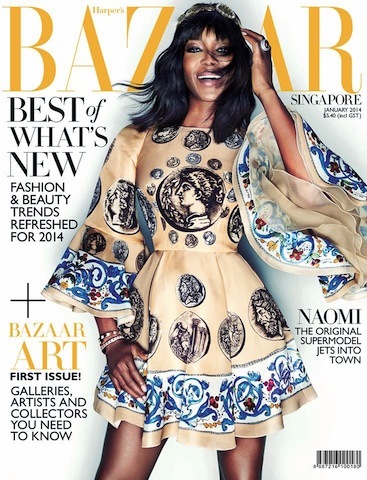 Supermodel Naomi Campbell, 43, is rocking a gorgeous confection from Dolce & Gabbana’s spring collection for the January issue of Harper’s Bazaar, Singapore. Hard to believe that she will be entering her mid-forties! She is definitely giving the “models” of today a run for their money. Campbell must be a getting her inspiration from the Queen of England, because they both are determined to hold on to their crowns until kingdom come. We are certainly not complaining – They both have earned their respective crowns. Cheers to a year filled with style and lots of bling!